U-Shaped Recession - What Does It Mean? 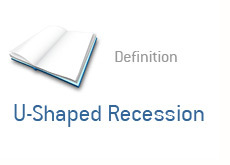 What is a "U-Shaped Recession"? Imagine that the letter U represents the growth of an economy. In a U-shaped recession, an economy first goes through a sharp recession. After that, instead of seeing a quick recovery (as is the case in a "V-shaped" recession), the economy stagnates and continues to decline for a period of time before finally recovering. A "U-shaped" recession usually lasts in the neighborhood of 12-24 months. Many economists feel as though the United States is currently battling its way through a "U-shaped recession". 2. Long period of stagnant or negative growth. 3. Recovery 24+ months later.